Many critics were not sold by the idea of the original Galaxy Note, it was an obvious gamble for Samsung, but it paid off more than anyone could have ever anticipated. With widespread popularity, the original Galaxy Note carved it’s own niche in the mobile phone and tablet world: somewhere right in between. This hybrid appeals to a broad range of people, for a number of reasons. Now, the only competition for the original Note is the latest version: the Galaxy Note 2, which has numerous improvements, and (if you can believe it) is even bigger than the previous model. Launched with the latest from Android: 4.1 Jelly Bean, and complimented by Project Butter, the user interface is fast, responsive, and smooth. You also get double the storage and RAM than what was offered on the original model, maxing out at 128GB of storage once expanded via MicroSD. The Quad-Core 1.6 GHz processor is as powerful as ever thanks to 2GB of RAM. All of this power won’t take it’s toll on your battery life, either, with an unbelievable 35 hours of talk time on the 2G network. Speaking of, you will also benefit from the lightening fast 4G LTE network, making data transfer, browsing and streaming as fast as ever. The Note 2 is even bigger than the previous model, with a 5.5 inch Super AMOLED capacitive touchscreen which is crisp and vibrant thanks to the latest in display technology. Viewing range is broad, and colors are rich and saturated, making it ideal for watching movies and playing games. Writing and drawing with the accompanying Stylus pen is even easier with the large, sleek screen. 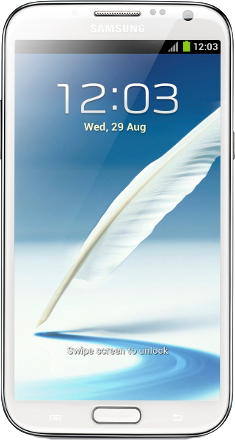 Many critics have raved that the Note 2, like it’s predecessor, is the best handset for mobile browsing. With it’s large screen, sleek yet manageable design, and Stylus pen, it is easy to hold and use. Thanks to it’s 4G LTE network support, image heavy sites and videos open in a split second, while zooming makes text crisp and clear thanks to the generous Super AMOLED display. Navigating and typing is accurate and easy with the Stylus pen, which makes for increased productivity. And with 64GB of internal storage (expandable up to an additional 64GB) you’ll have all the room you need for photos, movies, games, apps and more. Other features that users will appreciate include: streaming audio to a Bluetooth headset, buy or rent videos via Google Play, sharing media to a DLNA capable TV, and an FM stereo radio. The Galaxy Note was the beginning of a new generation: a smartphone tablet hybrid. Following in it’s footsteps, with some major improvements, the Galaxy Note 2 offers the features of both, and then some. The Note 2 is also a solid and reliable navigational device, thanks to Google Maps. With features like turn-by-turn navigation, public transportation routing, and most recently offline caching, you really feel the improvements from both Google Maps and Android Jelly Bean at their best. As for the accompanying “S-Pen”, Samsung may have singlehandedly revived the Stylus pen, making the Note 2 a modern take on the palm pilot. Not only does it offer every day benefits, such as more accurate typing and navigating menus or browsing, it also comes with it’s own unique features. Simply by removing the S-Pen from it’s holder, a splash screen menu of all S-Pen compatible apps will appear, letting you write a note (literally), draw or doodle, or even compile a more complex document, such as a diary entry with images, math formulas, or voice memos. And with an upgrade in pressure sensitivity in the screen, pen strokes are now realistic. The Note 2 will also allow you to make mobile payments, thanks to it’s NFC chip, which offers a variety of other perks for the user, as well; including ata transfer with Android Beam will allow you to share information between devices. Got a good deal on my new Galaxy Note 2, it delivery was fast, as well. The Note does take some getting used to, but I do love it. The Note 2 is still a bit of an awkward size for calls, but it is above and beyond most other phones on the market. I tried out the original, and was excited to get the 2 for myself. Got my handset really quickly, very happy with the service. Definitely recommending to my friends, many thanks. Loved the first Galaxy Note, and I love my Galaxy Note 2 even more. I didn't think it would be this different, but it's even better than the original.